Every year I come home after the first week of school and think, “How am I going to whip this group into shape?” I look to my old group of students and miss them and the strong relationships that were built within a given year. Then, reality swirls me back into the present and realize I have 23 shining new faces in my classroom. My 2013-2014 troops have already headed to learning centers this week, but one major tool has been missing, our 23 iPads. We received our devices on Monday of this week, but after the district updated my favorite learning tool I had to do some a manual login… 23 times. However, Wednesday was the day that the 23rd code went in, and I could begin front loading on how to take care of and manage our iPads. As teachers, we realize it is important to model how to complete a math problem or question while reading, but when working with tools the modeling can go over looked. It is especially important to model how the class should look and sound like when iPads are in use. I tell the students that whenever we go to get our iPads out of the cart, they must form a single file line. I call students by their student number in increments of five. When they walk their iPad back to their desk, their hands must “hug” their iPad. In the afternoon, when we put our iPads away it is the same process only backwards. Next week, my student’s morning work will be on their iPads, so I will not have to call to retrieve iPads because they will get their iPads from the cart as they enter the room. 2) Getting Attention in a classroom with iPads. The Gumdrop cases that my students have allow the iPads to be “face down” so students are unable to see the iPad screen. When I want to get my student’s attention and I want them to complete their work on the iPad, I simply say, “iPads down”. I then count down from 5. If a student does not have their iPad “face down” when I get to one, they lose their iPad. This is a big enough threat and usually no iPads are taken the ENTIRE year, but sometimes an example is made within the room. 3) “Whose iPad is this?” Never needs to be asked. 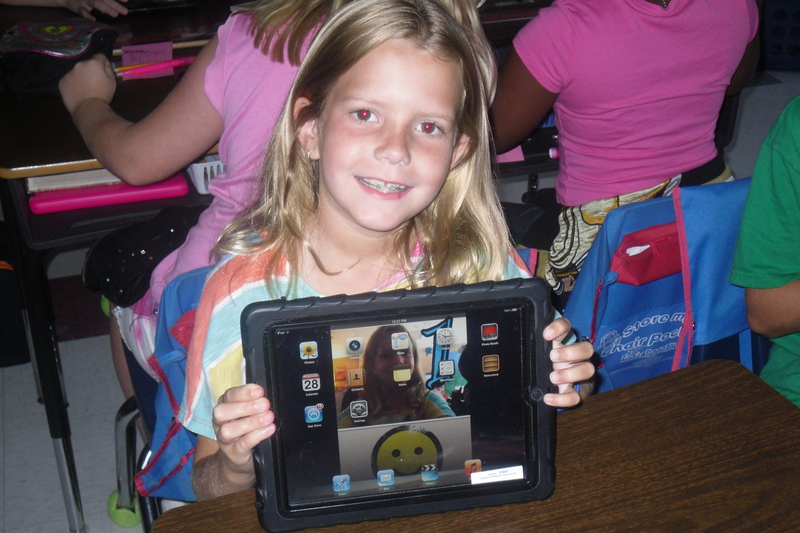 After the students know how to appropriately take their iPads out of the cart and what to do when iPads are no longer in use, it is important to have students save their face to the iPad home screen and lock screen. In years past I have had iPad screens that had backgrounds of dolphins, Mariah Carey, and Jadaveon Clowney. Now, I am in no way against any of these individuals or groups, but as far as I know I have never had the pleasure of teaching Mariah Carey. I require the students face to be on the home screen and lock screen of iPads. This year I had the bright idea to have students add their student number as well. Most of the students in my class have had experience using the iPads. With a quick demonstration of Pic Collage my students were able to put together a collage of 3 items: their photo, their student number, and one item they liked. In the past students have created collages that are filled with too many things they enjoyed and I could not find their face, so this year I stuck with the KISS system. With specific expectations in place, students are able to understand how to care for these tools, and I know I am still in control in the room. Soon, my eaglets will be “pushed out of the nest” and will be totally in control of their learning. Until then, I have to continue to build a clear and strong foundation. « Teach others the way you want to be taught!